Ford is rumoured to have canceled plans to revamp its mid-size Fusion for 2020 and it has already mentioned it won’t sell its smallest offering, the Fiesta, in the United States next year. Its fate in Canada is still unknown, but Ford’s Canadian division is likely to follow suit. On top of all that, one of the most recognizable nameplates in Ford’s lineup, the Taurus, is also rumoured to be on the chopping block. Ford isn’t the only one. GM has recently announced it will discontinue the Sonic and the iconic nameplate reserved for their full-size sedan, the Impala, is also said to be not long for this world. It isn’t because the aforementioned cars are terrible (though I’m sure a lively debate could ensue at such a statement), it’s because SUV’s and CUVs are essentially doing to the passenger car what Netlfix did to Blockbuster. Consumer preference and demand is everything. And everyone seems to want SUVs. I was never going to be in the market for those sorts of passenger cars anyway (okay, maybe a Fiesta ST had a sliver of a chance of being in my driveway), but it’s still disheartening to see passenger cars disappear at such a rapid rate. To me a regular sedan or hatchback has lots of advantages: smaller, and thus more maneuverable, lower to the ground and thus better handling, less weight and thus quicker and more economical and they’re just as versatile when in hatchback or wagon form. But those who adore SUVs argue the higher seating position and better ground clearance is better. SUVs also offer more options for getting all-wheel drive. Both of those advantages are appetizing for Canadian roads and seasons. But instead of killing off passenger cars for those of us who still appreciate them, can’t we come to a happy medium? Well yes, according to Subaru, we can. That’s where the hot-selling Crosstrek comes in. It is heavily based on the Impreza hatchback, which means lots of the advantages of a passenger car are at play, but it also has a raised ride height not to mention full-time all-wheel drive as standard (though admittedly that’s true for every Subaru save for the performance oriented BRZ). Did Subaru really build a vehicle that pleases all buyers? 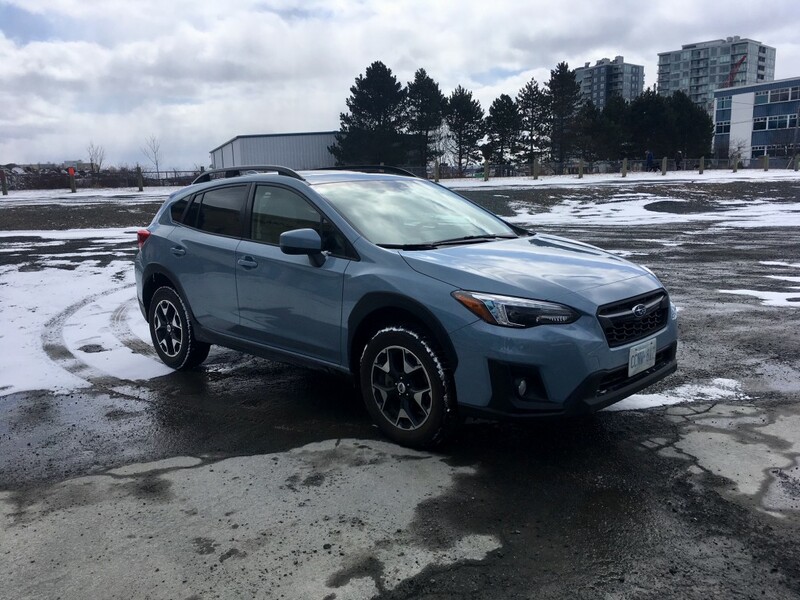 The new Crosstrek takes a lot of its styling cues from the recently reworked Impreza hatchback. That means less awkward angles and more interesting lines. 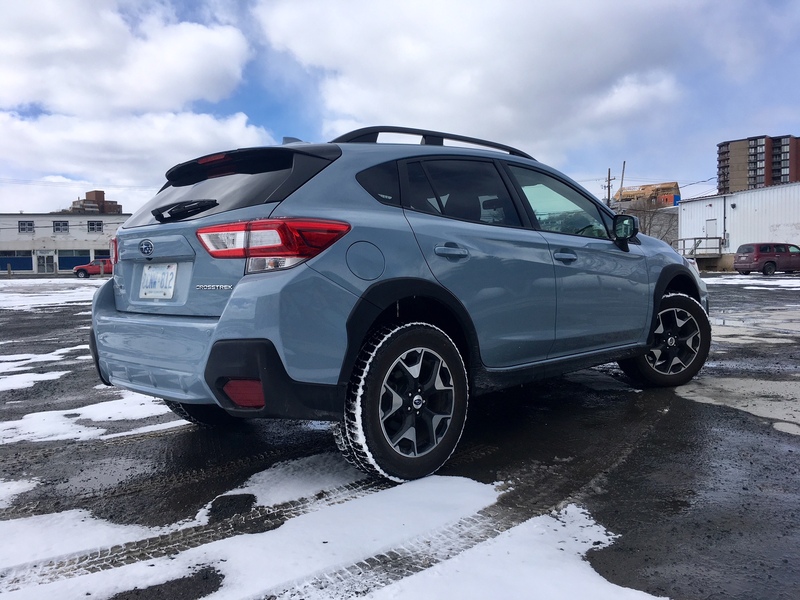 The Crosstrek adds black cladding to increase its rugged appeal and comes with unique eye-catching 17-inch wheels (18’s are available) with thicker sidewalls should you dare do a bit of off-roading. LED tail lights and brake lights are standard and responsive steering LED headlights (meaning the headlights will point to whichever direction you steer) are also standard on mid-trims and up. 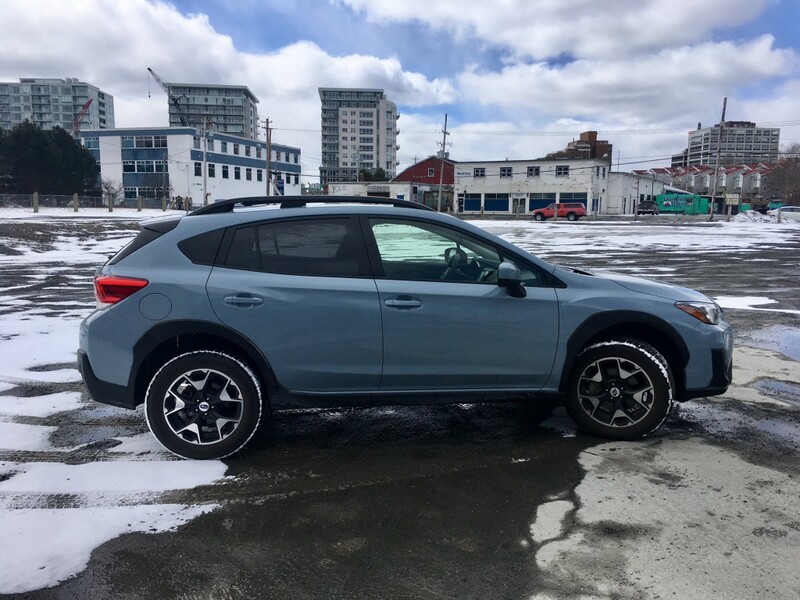 It’s a unique looking vehicle that is pleasing to this author’s eye, but in typical Subaru fashion, it likely won’t win any beauty contests. Just as Subaru has struggled to make truly pretty cars, it has also struggled to make pleasing, high quality materials in the past. 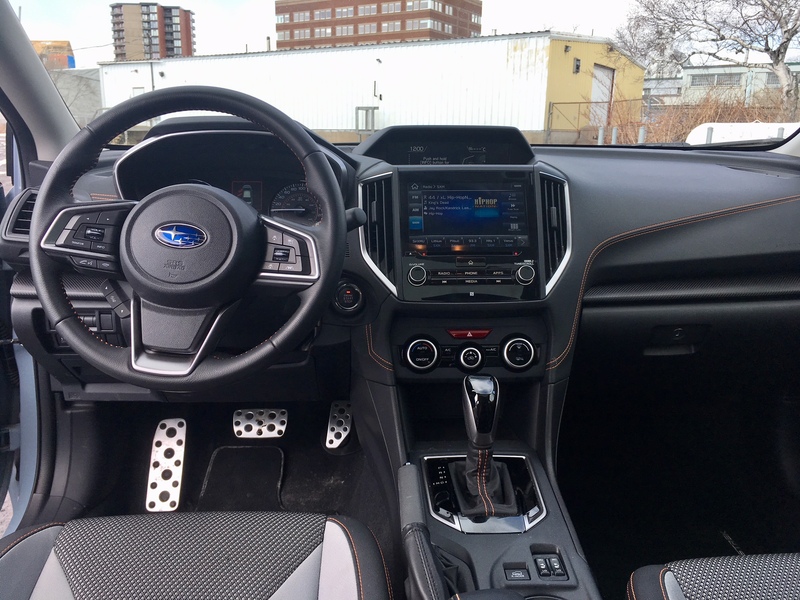 Its latest effort in the Crosstrek is leaps and bounds ahead of past Subaru interiors. The new design is a lot more pleasing to the eye, bordering on looking premium even, and the layout is much more intuitive, though I must admit to having a soft spot for the old quirky Subie interiors. There is now a much bigger, clearer and logically laid out display screen – a 6.5 inch screen is standard but it can be upgraded to an 8-inch screen like the one featured in my tester. A touch from your finger is all that’s needed to operate it and I’m happy to report that there were no obvious glitches or hesitation on the part of the infotainment system. If you’re one that prefers familiarity, Apple CarPlay and Android Auto come standard on every trim. The only real complaint is that the screen shows finger prints – more so than in any vehicle I’ve driven in recent memory. The sport bucket seats have a rugged high-quality feel but are comfortable at the same time. The orange stitching throughout is a nice touch and speaking of nice to the touch, there’s something about the texture and operation of the gear lever that feels spot on. 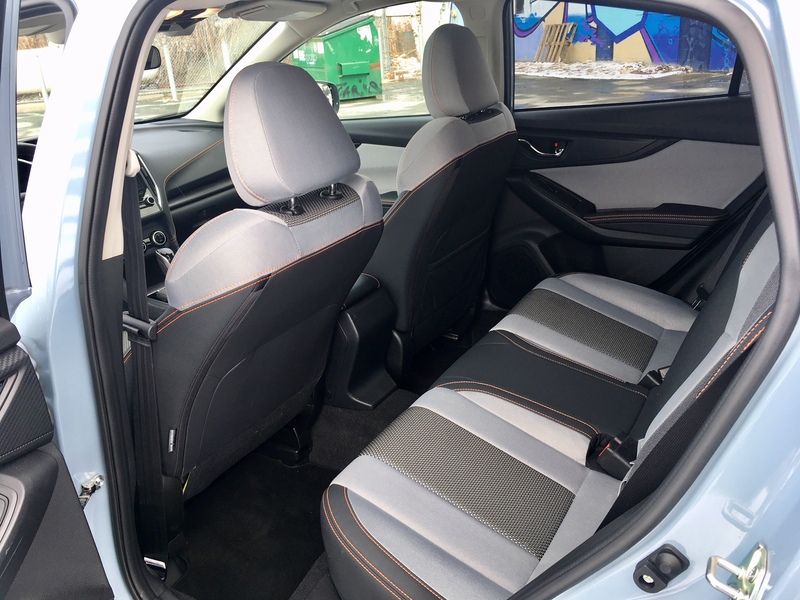 The new Crosstrek gets a longer wheelbase which means more interior room and it shows. Seating in the rear is adequate for most. There’s over an inch more knee/legroom and it is slightly wider as well. Outdoorsy types will be pleased with the 588 L of cargo room with the seats up. Those seats fold 60/40 to reveal a 1565 L cargo area. There is only one engine to choose from and it’s the trusty 2.0 litre 4-cylinder boxer engine that produces 152 horsepower and 145 pound feet of torque. This will be adequate power for most, but while horsepower is increased slightly for 2018, I think this engine could use 30 more horses, easily. If Subaru did that, it would put it squarely in line with offerings from Mazda and Volkswagen. 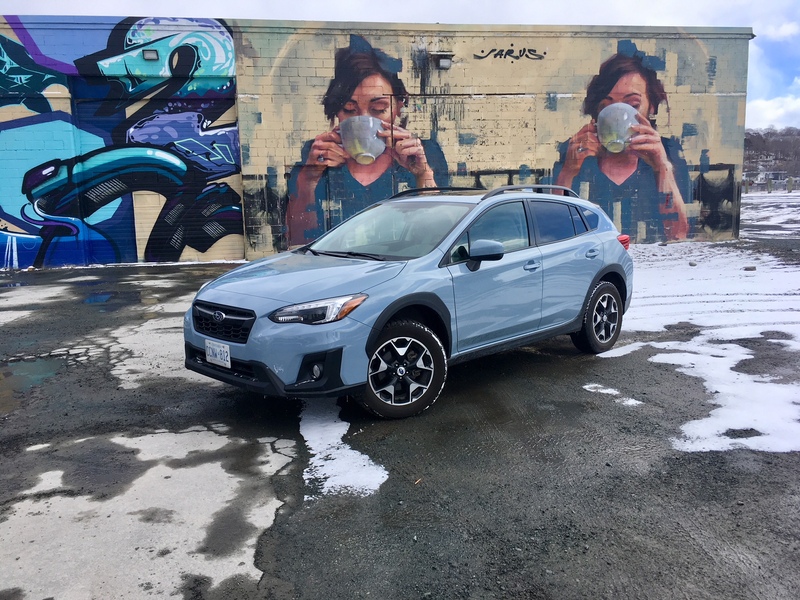 With that said, the Crosstrek never felt particularly slow and low-end torque was there when I needed it. There are two transmissions to choose from, a continually variable transmission (CVT) or a six-speed manual. Yes, six speeds. Good to see Subaru finally entering the 21st century by adding an extra gear to its manual offerings. The thing is though, those offerings are dwindling. The manual can only be had on the bottom three of the five trims available. If you’d like a more loaded Crosstrek but want to row your own gears, you’d better start writing Subaru a letter. Still, the CVT actually isn’t as bad as you might think. Its operation is smooth and refined and it has fake gears dialed in with the ability to shift them yourself. It also doesn’t seem to obviously neuter the engine as most CVTs tend to do. In terms of who makes the best CVT in the industry, I’ll add Subaru to the list alongside Honda. 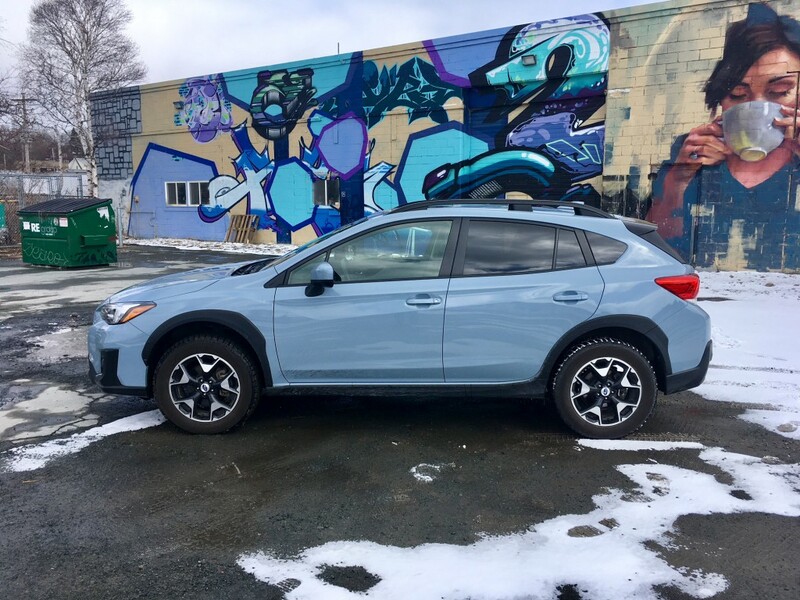 On the road the Crosstrek rides like a passenger car but has a similar ride height to an SUV, thanks to an 8.7 inch ground clearance. Since it isn’t sporting a massive body atop of the suspension like an SUV, handling is pretty damned good considering. 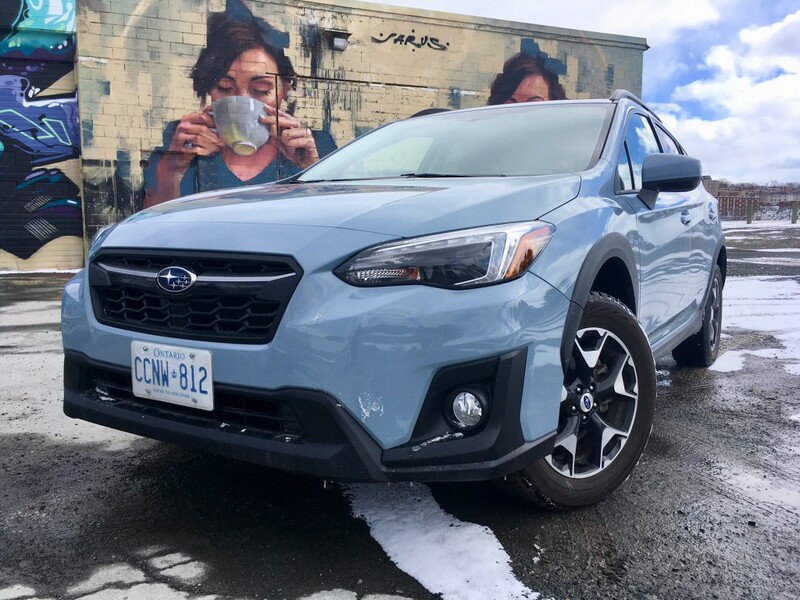 Steering feedback is dialed in nicely and the Crosstrek features torque vectoring, which essentially applies the brakes to certain wheels to lessen over steer, making it feel far more planted while simultaneously giving the driver more confidence. I’m glad to see the potential over steer taken care of, but I did notice some under steer during spirited cornering, though it wasn’t in large amounts. My fiancée described the ride as ‘floaty and comfortable’ and to be honest, I don’t really know what she’s on about. Comfortable sure (it’s by no means Lexus-like, though), but floaty is not the word I would use. While it handled bumps and potholes with ease, it still felt surefooted. There’s little body roll as well. Around town, it’s relatively compact size helped it tackle the concreate jungle with ease. 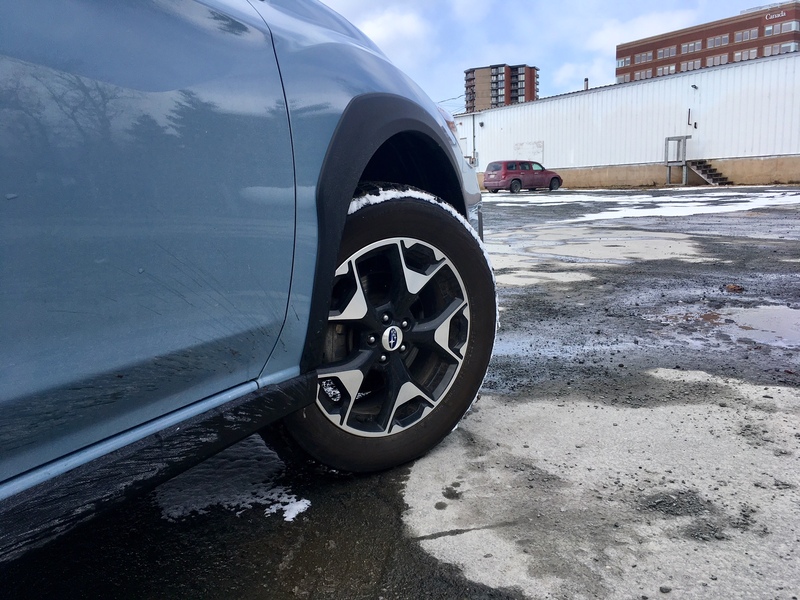 I didn’t have the opportunity to take it off-road to see how much difference the standard all-wheel drive system and extra ground clearance truly makes compared to a typical SUV, but I did get to drive it in a snow/ice pellet/freezing rain/rain storm. Yes, those types of storms are fairly typical in Nova Scotia. As someone who hates winter and literally everything about it, I was not pleased when I heard the forecast, that is, until I remembered what was sitting in my driveway. When the storm finally arrived, I eagerly took the Crosstrek out to see how it did. The verdict? Subaru Crosstrek 1, Mother Nature 0. 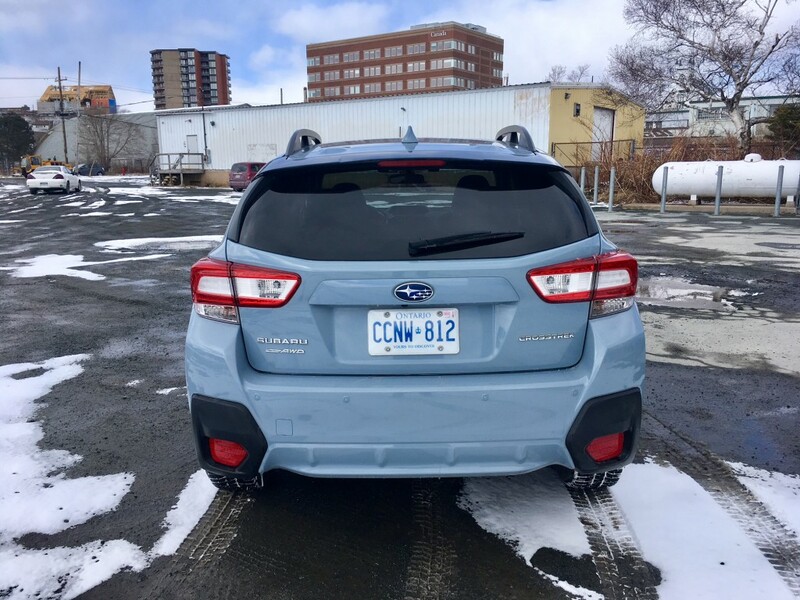 She was no match for the Crosstrek; it wouldn’t get stuck in any of that mess and more importantly it reacted confidently as if it was just another day of driving. Traction was great. You can equip your Crosstrek with EyeSight technology at the mid-trim and up. EyeSight is essentially a suite of safety technologies that largely use radars. It includes pre-collision braking, pre-collision brake assist, pre-collision throttle management, adaptive cruise control, lane departure warning, lane sway warning, lead vehicle start alert, and lane keep assist. 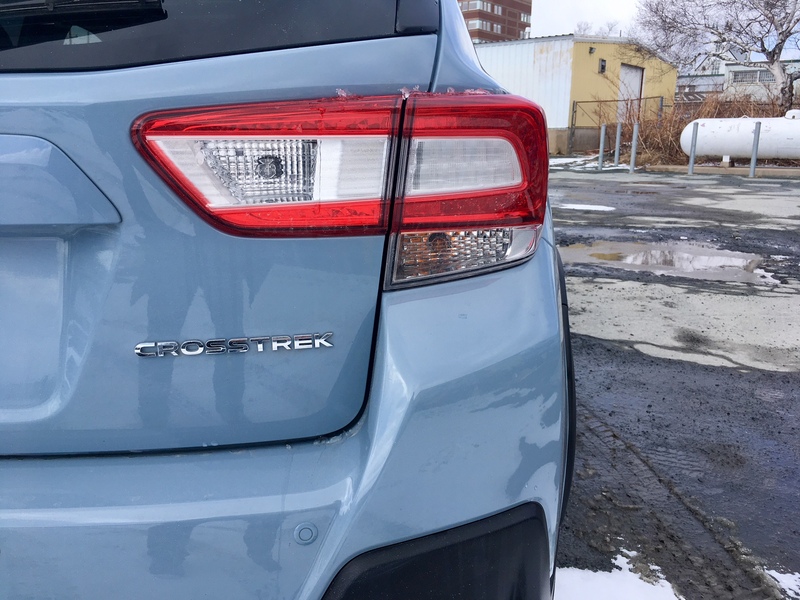 As automakers such as Toyota and Honda begin to start making their versions of said technology standard or at least optional on all models and trim levels, it seems glaring that EyeSight isn’t available at all on the lower trims of the Crosstrek. Just because you may not be able to afford the niceties of higher trims doesn’t mean you should sacrifice your safety. Get moving to address this ASAP, Subaru. Fuel consumption numbers largely depend on which transmission you opt for. If you get the six-speed manual, official numbers come in at 10.5 L/100 kms city and 8.1 highway. If you go for the more frugal CVT, those numbers drop drastically to 8.8 city and 7.2 highway. I would only rarely suggest someone take an automatic over a manual, but if fuel efficiency is a top concern, the CVT may be the way to go. Keep in mind, the CVT is a $1,300 option though. For the record, my CVT equipped tester came in at 8.7 L/100 kms in mostly city driving. 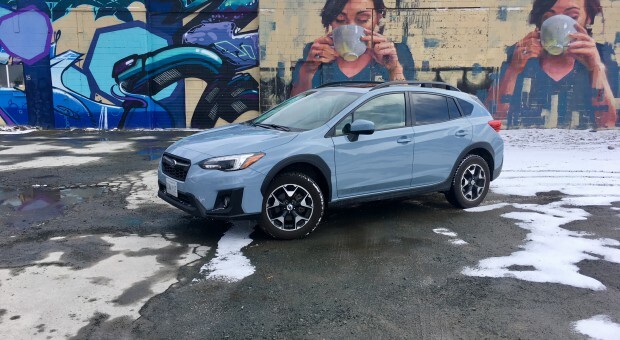 In the end, the Crosstrek is just one of those overall agreeable vehicles and overall well-rounded vehicles. It’s relatively good on gas, can tackle most of what Mother Nature (or nature in general) throws at it, is versatile, has adequate room and power along with a raised ride height for those who think they need it. 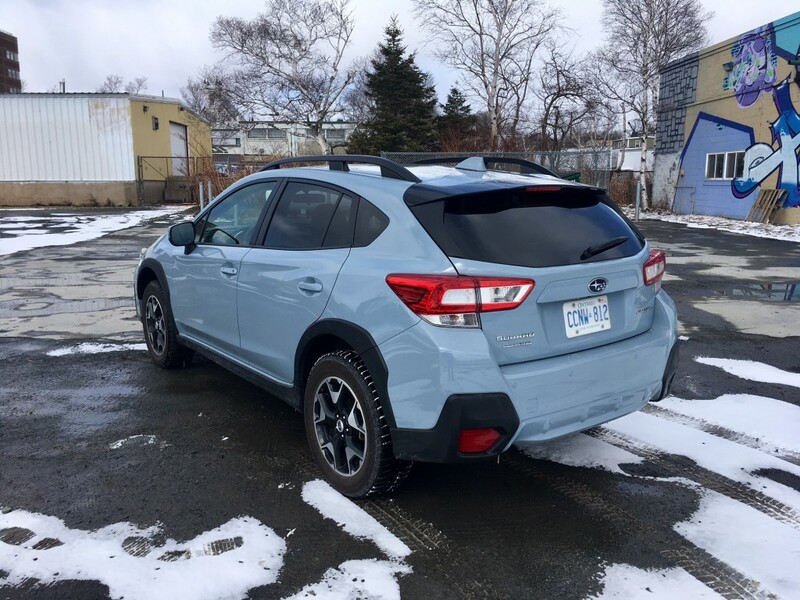 I was a fan of the first generation Crosstrek and continue to be with the new model. I’d say this vehicle is the best at blurring the lines between SUV and passenger car. No matter which camp you find yourself in, I can confidently say you’ll like the Crosstrek.